Thai Curry, one of our favorites and the favorites of many, is a warm dish of flavorful richness. There are many types of curries. 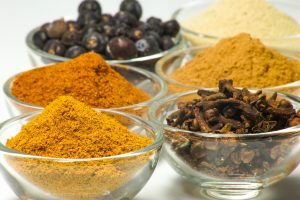 Curry itself is a spice mixture and can be slightly different depending on the where the cuisine comes from and the variations of that country. We obviously serve Thai curry, however many people think of curry as Indian. Let us give you some insight into the history of Curry, and our Curry. Curry is a mix of spices and these spices are used in many dishes in India and South Asia. Many of these spices all though originating in India, are not considered curry in the country itself. Many dishes were brought over to England, where the British began calling the many spiced dishes curry. Thai Curry tends to be more soupy. It usually consists of coconut milk or water, and curry paste (mix of some of the above spices), vegetables, and meat. There is Red Curry, Green Curry, Yellow Curry, Masamam, and Panang. Each curry tends to be different depending on the region and the mix of spices used. We serve a variety of curries on our menu, offering a taste of many variations from our country. Indian Curries tend to be thicker. Some Indian curries contain coconut milk, while many do not. The addition of coconut milk is more prevalent in Thai Curries, and some southern Indian Curries. More times than not Indian curry consists of water , vegetable broth, tomato paste, or yogurt. Thai and Indian Curries can be kept mild in spice, or made nice and hot to accommodate many taste buds. We love the spice and always tell our customers to add spice, as long as they can handle the heat. Our Curry is made with freshly ground spices and love. You may choose your type and the meat and/or vegetables that are in your curry. If you’ve never tried curry, we say try it! Try ours, try Indian curry, try Japanese curry, try them all. It really is just a difference in the spices and liquid base used. Tumeric, a very healthy spice, is used in most curries, and always in ours!